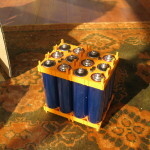 I spent last weekend building the batteries for the two electric bikes we are building, which took a lot longer than I thought it would. Firstly the packaging. Sending LiFePO4 cells by air demands very special packaging. 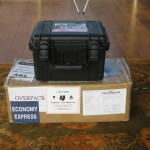 No more than two cells can be packed together in an inner package, and the outer packaging and inner packaging together must be able to withstand a drop from 1.2 metres, or an underhand pass by a courier! So the package that arrived from China (or rather two packages of 12 cells each) was rather large and bulky, probably 400mm by 240mm by 150mm. In contrast, the case I have chosen to use to contain the batteries on the bike are a petite 240 by 220 by 180mm approx, The first photo shows the “Safe Case” on top of the packaging, and the second photo the packaging used for the cells. 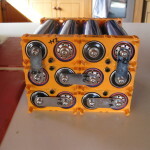 The actual assembly starts by connecting the rather clever interlocking support blocks and the batteries in the shape you require, in my case 3 by 4 batteries, which fits very nicely into the safe cases. 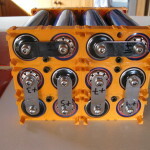 While I was building the battery block, I drilled holes in the blocks, and inserted 6 rigid tubes from end to end of the battery, alongside the cells. 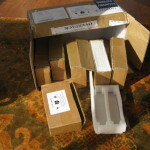 These are for the battery management system (BMS) wires, which need to be attached to the positive terminal of each cell. The cells are arranged alternating in direction, so a +VE is never next to another +VE terminal. 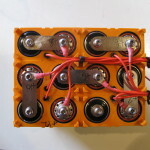 The next step is to connect the 12 cells together in series, so that the twelve 3V cells become one 36V battery. In actual fact, LiFePO4 cells have voltages that vary from 3.6 fully charged, down to about 2.9 when as discharged as you should let them go. Connection is by using bus bars, just simple steel plates with two holes drilled in, which match the spacing of the cells when they are assembled in the special connecting blocks. Each cell has a set screw in the end, which is used to secure the plates. The sequence you connect them is really up to the builder, but choose a start point (the -VE terminal), and connect the +VE end of that cell to the -VE end of the next cell in your sequence, and so on until all 12 cells are connect correctly. A voltmeter is used to double test each connection to ensure that the voltage is going up by 3.4 volts or so each time you make a connection – it helps clarify the mind about where you should be connecting things! As is entirely obvious from the photos below 🙂 the top two centre cells are the terminals of my battery, and the series goes around the block. The numbers on the plates are the +VE cells, starting from the negative terminal. This is to assist with attaching the BMS wires. The next step is to attach the BMS connections. 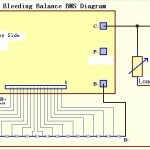 This consists of 12 wires in a plastic plug, which fits into the BMS boards. 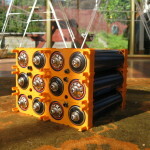 Starting from one end, each wire attaches to the next +VE terminal starting from the -VE terminal of the battery. 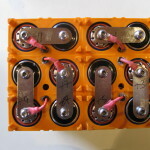 As the provided wires were never going to be long enough, a harness was made to connect to each cell. At each cell end, an eyelet terminal for 4mm wire with a 6mm eyelet was attached to the wire, if necessary the wire was threaded through the battery in the tubes I put in at the start, until all 12 wires were attached and all in roughly the same place at one end of the battery. To each of these twelve wires, crimping joiners were attached, and the 12 wires of the BMS attached to the joiners. As this was done, the voltage was tested at each terminal in the plastic block to ensure the expected voltage was achieved at each wire in sequence, i.e. 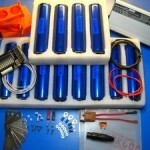 3.4v, 6.8v, 10.2v, 13.6v, 17.0v, 20.4v, 23.8v, 27.2v, 30.6v, 34v, 37.4v and 40.6v. However, as the cells joined together, they seemed to help each other out, and while each cell measured 3.4v, the final voltage of the battery came out to 42.0v exactly, the equivalent of 12 3.5v cells! 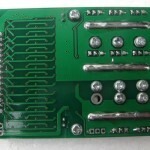 Similarly, when the plastic plug was put into the BMS board, the voltage was tested at each of the soldered points you can see on the left of the photo of the board, to check all contacts were made. As one of the wires had not been attached into the plug correctly, and I had to re-crimp and re-solder one wire, it was vital that this was done to check for other faults. The chosen method of connection to the bikes controller and motor is a 50AMP Anderson connector (this is really overkill, the system only uses 17amps max!) attached to the outside of the safe case. A wire from the positive terminal of the battery was taken directly to the positive terminal of the Anderson connector, attached to the battery with a 6mm eyelet terminal for 6mm wiring. The connector wire is 6mm 50amp wire. The -VE terminal of the battery was connected to the -B terminal of the BMS, 6mm eyelet connector at the battery end, soldered directly to the board at the other, quite a difficult job with 6mm wiring! The -C connection on the BMS was connected with a 6mm wire (soldered again) going to the -VE terminal of the Anderson connector. Finally, a 3 pin XLR socket was wired across the +VE and -VE terminals of the Anderson connector, back into the case with a short run of 2 core wire. A 3 pin XLR plug was attached to the battery charger in place of the RCA plug. 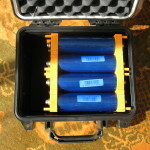 The XLR socket in the battery case was put inside a waterproof boot, as much for insulation as waterproofness. The XLR socket has a metal jacket, and I don’t want it connecting across the battery terminals by mistake! 1 Pings/Trackbacks for "Electric bikes – Batteries"